The Field Bet is one of the most popular wagers at a craps table. It’s easy to do, simple to understand, and it can give you a quick win. Here is what you need to know. You just put your chips in the part of the table labeled Field. The person with the dice makes their throw. If you win, the dealer will put your winning chips next to your original chips. You can either let it ride for another roll, or pick up your winnings. When you look at the Field area of the table, you will see a set of numbers written there: 1, 2, 4, 9, 10, 11 and 12. Those are your seven winning numbers. When the shooter next throws, if the total of the dice is one of those numbers, then you win. If the shooter’s next throw is one of the numbers which is not listed in the Field part of the table (5, 6, 7 or 8), then you lose the bet. For most throws, if you win a field bet, you get even money. If you made a $10 bet, then you win $10. The exceptions are if the shooter throws a 2 or a 12. In this case, you usually win double your bet, so you’d win $20. In some casinos, they triple your bet for a 2 or a 12. At first glance, it seems like you would have great odds on this bet. There are 7 different numbers that will give you a win, while there are only 4 different numbers that will make you lose. 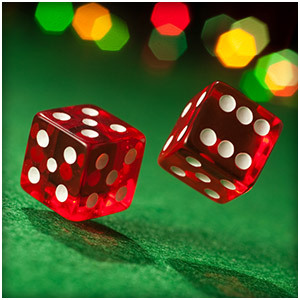 However, if you look at the different dice combinations that add up to those numbers, the situation is different. There are really 16 combinations of dice that will give you a win, and 20 combinations that will mean a loss.